KATHMANDU, Dec 03: Trekking Agencies Association of Nepal (TAAN) has conducted a three day training workshop on Mountain Security and First Aid in collaboration with President Mr. Maurice Duchene and team of Ice Himalaya at Nepal Mountain Academy, Thapagaun, Bijulibazar in which around 62 trekking professionals from various agencies had participated. The training has successfully begun in the coordination of Human Recourse and Training Department Coordinator Mr. Ram Bahadur Khadka. TAAN President Mr. Nava Raj Dahal inaugurated the program and extended warm welcome to all the trainers and trainees. He assured that the training will be an asset that will ensure safety and security in mountain areas by generating professional and qualified workforce especially in mountain tourism. The workshop is been supported by Embassy of France in Kathmandu – La France au Népal. 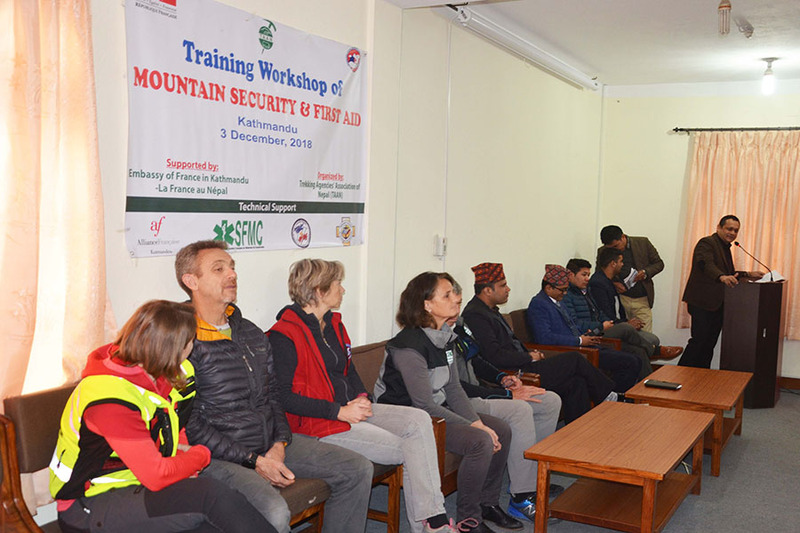 Alliance Française Kathmandu, Société Française de Médecine de Catastrophe (SFMC), A), Association Nationale des Instructeurs et Moniteurs de Secourisme (ANIMS) and Secours En Montagne France are the technical supporters of the workshop. TAAN First Vice President Mr. Jeeban Thapa Magar, Coordinator of Human Resource and Training Department Mr. Ram Bahadur Khadka, TAAN Executive Members Mr. P.K Sherpa, Mr. Gopal Shrestha, Director General of Nepal Mountain Academy Mr. Romnath Gyawali and Administration Officer Mr. Uttam Bhattarai were also present in the program.